F-Secure Freedome VPN Review 2019: Trusted & Used Worldwide? F-Secure Freedome VPN is a one of the security products by F-Secure. This VPN product is also a reliable and useful tool trusted and used by thousands of users all around the world. F-Secure Freedome VPN is built based on a strict non-logging policy. That means F-Secure will never track what you do on the internet or log or collect any browsing history. Your personal information will also not be collected or shared with others. No-logging policy is one of the most important factors to impact why people would use the VPN tool. What’s more, F-Secure Freedome VPN is based in Finland where practices the strict privacy laws. F-Secure creates fast and stable network with hundreds of server locations in different countries across the Americas, Europe, Asia, Oceania, and Africa. Therefore, F-Secure Freedome VPN provides fast and stable speed. You also can switch to different server locations you need without additional charge. F-Secure provides unlimited bandwidth. F-Secure Freedome VPN can work on all major operating systems like Windows, macOS, Android and iOS. F-Secure Freedome VPN is designed to be intuitive and easy-to-use with handy interface. People usually use other F-Secure security products while adding this VPN software. F-Secure Freedome VPN provides complete privacy, hides your IP address, change your real virtual location and access any blocked contents. Even though you are connecting to public WiFi network, you are still protected by this VPN and can surf safely. F-Secure Freedome VPN gives 30 days of money back guarantee to ensure an excellent and reliable VPN service. And customers can use the VPN service with total ease. If you are not satisfied with this F-Secure Freedome VPN service, you can ask their support for a full refund. Money-back guarantee is also one of the important selling point when users come to select their VPN service. Some people even treat it as a free trial to test and experience that VPN service. Therefore, many VPN service providers will offer money-back guarantee or free trial. But rare provides would offer both money back warranty and free trial at the same time. One of them can help customers to test the VPN when they first time use the VPN service. 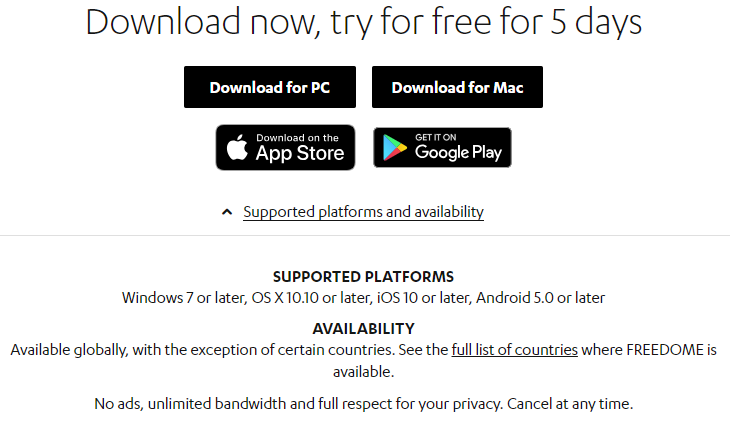 F-Secure Freedome VPN is a newly released product from F-Secure company, and now their technical team just designs the VPN tool to support these popular and major operating systems including Windows, macOS, iOS, and Android. In future, they will gradually upgrade their software to be more powerful in supporting other platforms and devices. F-Secure gives 3/5/7 simultaneous connections, but it costs in a different pricing. You should choose the suitable plan according to your requirement. Usually F-Secure FREEDOME for PC, Mac, Android and iOS can be purchased and downloaded via the F-Secure website. It’s also convenient to download F-Secure FREEDOME for Android from Google Play Store and for iOS from Apple App Store. F-Secure Freedome VPN gives internet users complete privacy and anonymity on the internet. It hides the real IP address and masks the real location, then the real identity will be also hidden. Other netizens and websites people visited will just see the IP address assigned by F-Secure Freedome VPN. You can choose the needed virtual location which gives your device an address in the selected country. F-Secure Freedome VPN also has an automatic mode which can automatically help customers to choose the connect to the server closest to you in order to give customers the best possible connection. Freedome VPN currently gives virtual locations as following: Australia, Austria, Belgium, Canada, Czech Republic, Denmark, Finland, France, Germany, Hong Kong, Ireland, Italy, Japan, Mexico, Netherlands, Norway, Poland, Singapore, Spain, Sweden, Switzerland, United Kingdom, USA. F-Secure keeps improving and upgrading their Freedome VPN, and more server locations will be expanded in the near future. Internet users can freely use this Freedome VPN to access any websites and steam any contents from anywhere. Although it does not provide as many server locations as other providers, it does build the servers in all popular and necessary locations like United States and United Kingdom. How Many Devices Can You Connect with a Single FREEDOME subscription? F-Secure Freedome VPN provides three packages different in number of simultaneous connections. You are able to select a subscription of 3, 5, or 7 devices. If you choose and purchase the package with 3 devices licenses, you can use the subscription code on up to 3 devices only. So, when you use up these 3 device licenses, you will not be able to use this subscription on a 4th device, and the app will prompt you to transfer a license. You are kindly noted that if you uninstall FREEDOME from a device, this does not release a license automatically. If you go on to reinstall FREEDOME on the same device, this takes up another license. Your network traffic will be completely encrypted and protected by F-Secure Freedome VPN as it utilizes the strong encryption. Freedome VPN employs TLS, 2048 bit RSA keys with SHA-256 certificates, AES-256-GCM for the control channel of OpenVPN port on Windows, Mac and Android. For iOS device, F-Secure designs to use IPSEC/IKEv1 protocol with AES-256 + HMAC-SHA2-256, 2048 bit RSA keys with SHA-256 certificates and IPSec/IKEv2 with AES_GCM_16_256, 2048 bit RSA keys with SHA-256 certificates. Here you can see that F-Secure Freedome VPN uses the strong encryption mode to protect and encrypt all the internet traffic of the internet user. Encryption mode is usually one of the most important choosing point when people come to select the VPN tool. This is because if there is no advanced encryption mode, the internet traffic will not be able to be protected completely. And internet user’s information and data may be leaked out or hacked by ISP, government, hackers and other prying eyes. Kill Switch is an important feature and technology usually used to prevent accidental leakage of traffic to the internet. Due to many different reasons, the VPN connection between FREEDOME client and server would drop accidentally, which will make your internet traffic exposed. Once the VPN network disconnects, the internet traffic will travel through the server of your ISP by default. In this case, the ISP will soon know that you are connecting a VPN network. They even log your browsing history and collect other information. Therefore, there should be some tool which can stop all internet traffic when the VPN disconnects unexpectedly. VPN Kill Switch is the tool specifically designed to solve this kind of problem by stopping all internet traffic from entering or leaving your device when VPN connection fails. VPN Kill Switch is a strong and useful measure to prevent the internet traffic from being traveled back through the server of internet service provider and hacked by other prying eyes. F-Secure Kill Switch gives different settings on their VPN Kill Switch feature, so you can choose the different settings, but it has the same function that to block network traffic until connection to the FREEDOME VPN backend has been recovered. F-Secure Freedome VPN’s Powerful Kill Switch right now works on android, iOS, Windows, and macOS operating system. in short, F-Secure Freedome VPN’s Kill Switch is a smart and useful feature which can automatically shut off your internet connection whenever your Freedome VPN gets disconnected. VPN Kill Switch works like an emergency firewall to prevent your VPN network from being leaked out and exposed to others. With this kind of Kill Switch, you can get complete security and privacy. Your private information will not be easily caught by any prying eyes. What a F-Secure Freedome VPN can Do for You? Like other reliable and strong VPNs, F-Secure Freedome VPN is also used by internet users to get protection for their online privacy, security and surf anonymously. And the most important thing is to bypass different internet restrictions and access different websites. Protecting privacy information, accessing blocked websites and contents on the internet and allowing netizens to browse websites anonymously are all important tasks for a VPN tool. A strong and reliable VPN should have these strong abilities. That’s why people use a VPN on their devices. Usually if you don’t use a VPN tool, all your internet traffic just goes through the server of your ISP, so ISP can easily watch what you do on the internet and collect your browsing histories. All your internet activities will be logged by your internet service provider. Actually, your personal information will not be protected but leaked out to the ISP. Some ISP even cooperates with government and share your personal information with them. In this case, your personal information will be in a risk. However, if you use a VPN tool like F-Secure Freedome VPN, it can protect all your internet traffic from being hacked. F-Secure Freedome VPN utilizes the strongest encryption mode to encrypt and protect the internet traffic. The most advanced encryption method is hard to be broken by anyone even not the fastest computers in the world. Almost the reliable and strong VPNs use the strongest and most advanced AES-256 which is the longest algorithm. So, it is difficult to be encrypted by anyone in the world. Actually government, military department, banks and other data storing department use this military-grade encryption to protect their personal information and other data. Therefore, VPN with this strongest encryption method can completely protect your online privacy, as all your data, communication info and other personal information will just go through the encrypted tunnel created by F-Secure Freedome VPN over public network, and no one can access and steal your private information, and now can spy on what you do on the internet. Even though you are connecting through the low-security public WiFi network in café, hospital, airport, library, supermarket, restaurant and so on, you are still protected completely by this F-Secure Freedome VPN. Public network especially the Free WiFi hotspot is usually spied on by hackers, snoopers and other prying eyes which aim at monitoring internet user’s network and intruding into the network to spy on what they do on the internet. Free WiFi hotspot is usually a dangerous environment for internet users but a great place to breed those hackers, snoopers and any identity theft or ransomware on the internet. F-Secure Freedome VPN has a strong WiFi security feature which mainly protects and encrypts your internet traffic especially happening under unsecured WiFi connection, so that your internet traffic is protected completely and impossible to be intercepted. You will not be tracked by any snoopers or hackers when connecting to the low-security WiFi hotspots. Besides, you can avoid those malicious advertisements and potentially unwanted programs or dangerous websites if you have run this F-Secure Freedome VPN on your device while you are surfing on the internet and browse the website. F-Secure Freedome VPN is designed to be strong enough to block unwanted third party tracking and malicious sites. And at the same time, F-Secure Freedome VPN can prevent those advertisers from collecting your private information to selling your privacy matters. Some advertisers use the strong cookies to track your online trace and spread different ads in order to attract you to click on and then spy on what you do on the internet. Those identity thefts also use different methods to track what you browse and enter on the internet. In reality, it is not safe to surf on the internet even your private information and online activities are exposed to these prying eyes without any knowledge. So, if you use F-Secure Freedome VPN, it can ensure you online security and totally block those suspicious ads, websites, programs and any kinds of popups. There are many different internet restrictions to block people to access certain websites and contents. The most common restrictions imposing on websites include net censorship or internet censorship and geographical restriction. Internet censorship is usually imposed by government, schools, universities, companies and official organizations to prohibit people from accessing specific websites and contents. Internet censorship is created to control and limit where and what people can view, discuss and publish on the internet. Many countries like China, Russia, North Korea, India, Syria, Iran, UAE and more are practicing strict internet censorship to supervise and control their national internet security. The strictest and most sophisticated internet censorship is that one created by China. Almost popular and major social media, messaging, sharing, streaming websites and apps are prohibited by the China’s net censorship. Anyone traveling to or living in China knows that it hard to access and use these foreign resources when using the IP address in China. Net censorship in China works together with anti-VPN, ISP and other specific organizations to block any attempts to accessing popular foreign websites. The other common restriction is geo-blocking or geo-restriction which is usually used by websites and companies to allow people in specific locations to access or use their websites and contents. The most typical example is BBC iPlayer in UK and Netflix in USA. BBC iPlayer just allows people living in British or residents to watch their contents. If you want to access BBC iPlayer website and watch their videos and programmes from outside UK, it will not possible for you to watch their contents. Similarly, Netflix is located in USA and just allows people in USA to watch their movies, programmes, TV shows and other contents. If you are trying to access Netflix from those places disapproved by Netflix company, you are still completely blocked. Some YouTube videos are also limited by the uploaders to restrict certain people to watch their videos. To deal with these internet restrictions, it is the best choice to use a strong and high-performance VPN tool like F-Secure Freedome VPN. It can help access any blocked websites and contents by changing your real IP address of your device like computer, and then it gives you a new IP address. So, you can have a new identity. Usually an IP address can tell locations, countries, ISP and other information. But once the real IP address is masked by a new one, you are given a new identity. Others like websites and other netizens will not know where you are really from but just know your new identity. F-Secure Freedome VPN alters your virtual location and make you fake less restrictions, then you can easily access any blocked contents and websites on the internet. For example, you are trying to access Netflix from China by using this F-Secure Freedome VPN. When you switch on and put your Freedome VPN to connect to server located in USA, then you will soon be assigned by one IP address located in USA, next you open Netflix website, and Netflix website will just see your new IP address based in USA but not that one based in China, then you are approved accessing their website and watching the contents in China. By changing your real IP address, it will make you look like from other countries. That’s how you can access blocked websites by using F-Secure Freedome VPN. F-Secure Freedome VPN is newly designed by F-Secure company. F-Secure has provided many excellent and advanced products in protecting internet security for customers. So, F-Secure Freedome VPN is also an advanced and reliable product generated by F-Secure. In fact, thousands of users now are using this F-Secure Freedome VPN to protect their internet security, access websites and safeguard online activities. F-Secure Freedome VPN can protect 3 devices, 5 devices and 7 devices at the same time. And depending on your subscription package, you can get protection on different number of devices. F-Secure Freedome VPN utilizes the strongest encryption mode and VPN Kill Switch to ensure all your internet traffic being protected whenever you are. It changes your actually IP address so you can surf anonymously on the internet. What’s more, F-Secure Freedome VPN does not log any of your internet traffic or watch on what you do online, as they have a strict no logging policy. Internet users can use this F-Secure Freedome VPN to bypass any internet restrictions and access any blocked websites and contents from anywhere. F-Secure Freedome VPN is a great choice for internet privacy, security and freedom internet activities.